QUINTESSENTIAL DOWNTOWN LOCATION! 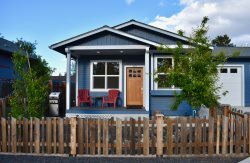 Our newly remodeled 1940’s cottage in the heart of Bend has everything you need for a perfect Central Oregon getaway! Experience the authentic Bend lifestyle when you wake up to sunshine and walk across the street to Drake Park and the idyllic Deschutes River. Stroll to downtown and enjoy one of the many great restaurants, breweries, galleries and shops. Walk across the bridge and the ultra-popular 10 Barrel Brewing Company, your starting point to the Bend Ale Trail, is a mere stroll away! Hop on a cruiser bike that we provide, and ride along the river to the Old Mill District to enjoy an IMAX movie, shopping, or riverside dining. World class bike trails, paddle boarding down the river, live outdoor concerts at Les Schwab Amphitheater, and the winter shuttle to Mt. Bachelor are all right out your front door when you are our guests at the Riverside Cottage. Relax on the wide front porch and watch the day go by - Bend style! Or, cozy up in front of the fireplace and watch a movie on the HDTV, or BluRay DVD player. The open floor plan is ideal for families and friends! Create a gourmet meal for the entire family in the fully stocked, newly remodeled kitchen. Enjoy your meal on the deck with friends, cook out on the huge gas grill, or relax in the hot tub under a desert sky filled with stars. Downstairs is designed for fun in the spaciously remodeled family room. Play a game of foosball, enjoy a board game together in front of the second fireplace, or join in a game on the Wii from our collection of disks. Spread out with the whole family for a BluRay DVD in HD or take a quiet respite and enjoy a great selection of books for all ages from the library. A third bedroom with a double and twin bed is also available downstairs. This is a great set up for multiple families with kids or groups of friends! The 1800 sq. ft. has a cozy cottage feel while providing room enough for everyone without feeling crowded. This house is fully stocked with all the amenities you need for a one of a kind Bend vacation. All of the beds are super comfy with fresh clean duvets and high thread count linens. There is a washer and dryer, free wireless internet, tubes for the river, sleds for the snow, and cruiser bikes for you to explore Bend! We look forward to welcoming you as our guest at Riverside Cottage! • Fantastic Location in the heart of Bend! Walk to Drake Park, Downtown Bend, the Deschutes River, and the Old Mill District. • Charming fully restored 1940’s cottage with beautiful hardwood floors. • Open layout that’s perfect for family and friends. • Family Game Room with Wii, foosball, games, and more! Great stay for our family getaway with 4 adults, 2 kids, and family pet. Perfect location! We had such a great week at this house. The location was great for walking to nearby restaurants, or into town through the beautiful Drake Park. We loved Bend and will definitely plan a return trip! Great location and perfect house for 3 couples with kids! We had such a great experience at this house! So easy to walk into town and to restaurants! The house worked greated for kids and loved the hot tub and cruiser bikes! Would definitely recommend this house to friends! We rented this property for 3 nights and couldnt have been happier. The house is in a great location within walking distance of downtown, the river and a few breweries. The house was clean, well stocked and comfortable. Communication with management was easy and check in/out was a breeze and made this vacation, a vacation. We will most definitely be back. We loved our stay at Riverside Cottage and hope to stay there again. The house was just as described and Paige made check in a breeze! I have stayed in many properties in Bend before and this place was a great deal, in a perfect location for activities and walking distance to restaurants and downtown. We had a great time and felt comfortable in the house. It is well stocked and very clean. We will definitely be back! The house was perfect for our group of 6 with two couples and 2 kids. Its in a great location and Bluebird was a very responsive host. This is a great house and close to downtown Bend. You can walk or ride bikes to everything. 6 of us, including teenage kids, had plenty of space. The basement is great with lots of games and activities. Kitchen is well equipped. Hot tub is nice. Shed is full of bikes (and bike pump and helmets). We had a great time! We walked to multiple breweries and restaurants. Very easy to get around. The beds were comfortable and there was plenty of room for the 5 of us. Excellent, perfect location, well maintained, and clean. Very accommodating! Great spot, awesome caretakers. Perfect for a night in Bend. Lovely location, house, kitchen, wifi, and yard. Close to everything. Coffee situation is on point- electric kettle, French press, etc. New washer dryer were useful after days on the road. My family and I spent 5 days at the Riverside cottage and loved it! The house was beautiful and very clean. We loved the big kitchen for cooking with everything we needed. The location couldnt have been any better. It was a quick drive to Bachelor for skiing and just blocks to great breweries and restaurants. We rode the bikes around town and to a great drop in yoga class and "The Yoga Lab" followed by delicious cider at the "Atlas Cider Co." right next door. We are looking forward to returning for a summer visit. We had a wonderful family trip to Bend, 6 adults and dog in the house and there was still plenty of room to spare. The house was beautifully kept, clean, cozy and had everything we needed! We took advantage of the fabulous location near the pubs, restaurants and town! The bikes and toys in the back shed were a great addition and there was enough for each person! Wonderful location, beautiful home and great experience! We will definitely be back! My husband and I planned this trip to take our three daughters (21, 19 and 13) away during Christmas break. This was our first time in Bend and the house was perfect. The layout provided great get-together space but also private space for the kids to play games in the basement. The easy access to Drake Park was perfect for taking our dogs for a walk. There were many great places to walk for dinner or beverages. It was easy to get to the shuttle if the kids decided to head to Mt. Bachelor. I would certainly book again if we come with a group to Bend. Four of us guys have been going on the annual guys trip for years, and we decided to head to Bend a few years ago. We have stayed at this place for 2 years in a row, and we are definitely going back in 2016. The important reasons why this house gets 5-Stars are: the place is within a walking distance from downtown so we dont have to drive after having a few beers. It has 2 bedrooms upstairs along with a basement bedroom that has 2 beds since we are all happily married to women. (There is also a "cove" with a bed in basement so you can have 5 people sleep comfortably.) The last but not the least, the bathroom fans work fine, which is essential to guys trips. We had a great 2 night stay at the Riverside Cottage. We played numerous board games and are now seriously considering getting a foosball table for our own house! Its a lovely home in a great location. Thank you!! Thanks for a wonderful time for our family gathering, the configuration of your home was perfect for our family of 6! Weve had an absolutely fantastic time at the Riverside Cottage. From being able to walk downtown and being only a 1/2 hours drive to Mount Bachelor, it couldnt be better! We had a great time revisiting Bend. Love this place! Hope to be back! What a great house! The beds are comfortable, bathrooms are spacious, kitchen is great to work in with all you need to make great meals. Location is perfect - close to town and to trails on foot or bikes. We have loved our visit to Bend from Ohio, and we have appreciated this house so much! The location has been perfect and we have loved using the bikes. Thank you!